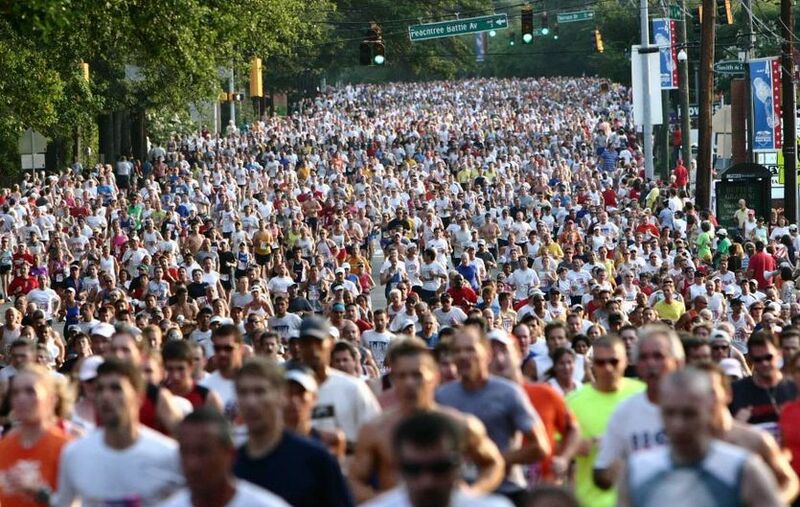 The AJC Peachtree Road Race, organized by the Atlanta Track Club, is the largest 10K in the world. 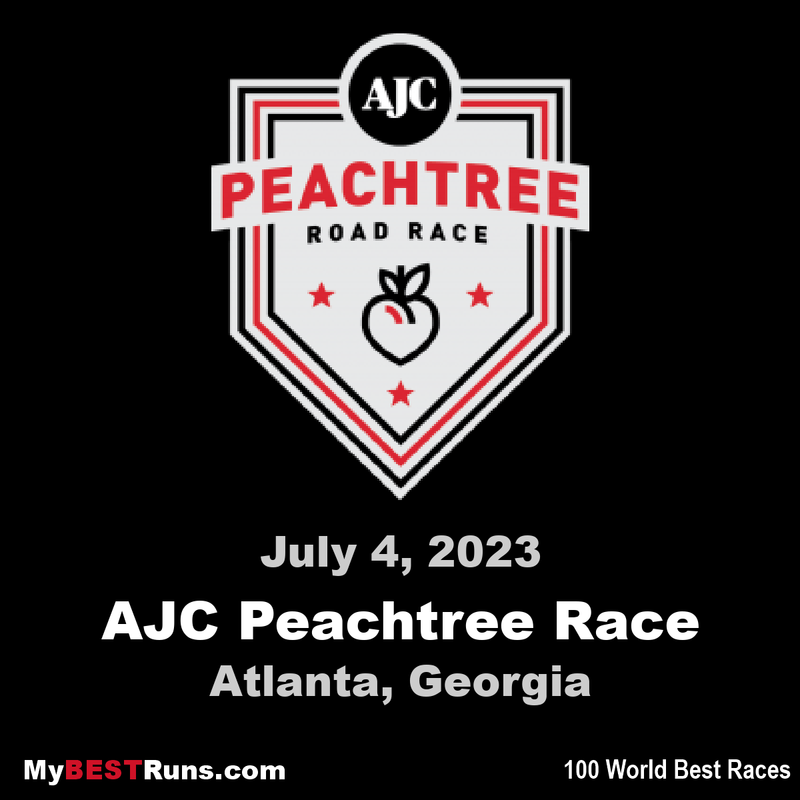 In its 48th running, the AJC Peachtree Road Race has become a Fourth of July tradition for thousands of people throughout the metro Atlanta area and beyond. Come kick off your Fourth of July festivities with us! If you did not get accepted in the AJC Peachtree Road Race lottery or are looking to participate still, you may register for a Kilometer Kids Charity Race Number, benefiting Atlanta Track Club's Kilometer Kids youth running program. Challenging course, well run and spectator friendly! Korir won the 48th annual AJC Peachtree Road Race Elite Men’s Division with a time of 28:16. He barely edged his training partner, Shadrack Kipchirchir (28:17), who he flipped spots with throughout the race. “You know, you feel that pain for all those miles, and to be able to win it at the end, it’s rewarding,” Korir, a Kenya native, said. His 28:16 mark is the best at the Peachtree since Mosinet Garemew posted 28:07 in 2013. Sam Chelanga, who trains with the other two, finished third at 28:25. The top three were all from Colorado Springs, Colo. The 30-year-old Korir was the 2017 USA Cross Country champ, USA 15K champ and USA Half Marathon champ. He is also a two-time NCAA champion. He now has a win in his AJC Peachtree Road Race debut. The Peachtree is Korir’s fourth USA title of the year and sixth major victory. He added that he almost ran out of energy. Korir dropped to the ground to stretch out cramps just after finishing. Based in Colorado, Korir was more accustomed to dueling the altitude than humidity. The heat was especially bad Tuesday, with the Atlanta Track Club issuing a red-flag warning the day before for extreme conditions. But Korir said he stayed patient through his exhaustion — drinking plenty of water — and it paid off. Korir graduated from Iona College in New York in 2012 with a degree in political science. He joined the army in 2015, and became an American citizen at the end of that year. He participated in the 2016 Olympics in Rio, finishing 14th on the 10,000-meter team. Korir came close to his personal-best time (28:09). Kipchirchir (28:12) and Chelanga (28:11) fell shy of their marks. The Peachtree record is 27:04, set by Joseph Kimani in 1996. Kipchirchir, 28, was a 2016 Olympian and placed 21st in the 2017 IAAF World Cross Country Championships. Chelanga, 32, finished 11th in the same event (best among Americans) and holds the NCAA record in the 10,000-meter at 27:08.49. The 2017 AJC Peachtree Road Race prize purse of $70,000 was awarded to American runners, with the top male and female earning $10,000.